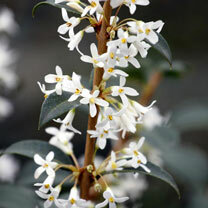 Osmanthus burkwoodii is an easy to grow dense evergreen shrub with a rounded growth habit. From mid spring clusters of small, highly scented white flowers are produced which are attractive to bees and provide early season nectar. Height 2.5-3.5m; spread 2.5-3.5m. Supplied in a 7.5-10 litre pot. Osmanthus burkwoodii is an easy to grow dense evergreen shrub with a rounded growth habit. From mid spring clusters of small, highly scented white flowers are produced which are attractive to bees and provide early season nectar. Height 2.5-3.5m; spread 2.5-3.5m. Supplied in a 3 litre pot or 7.5-10 litre pot. Ideal for beds and borders. Prefers full sun or partial shade.